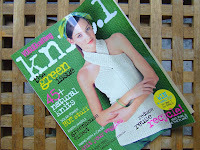 ...if I had only one project on the needles at a time? 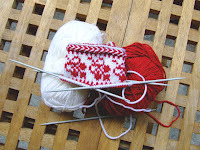 - white and dark red yarn for the Norwegian gloves (from the Japanese book of knitting). 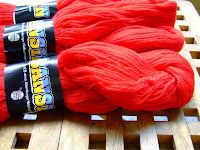 - 300 g of red wool or wool with something (it doesn't say on the label...), very soft, it's from the second hand shop and it's going to one of my two choices of sweaters, not sure which one yet, but I couldn't pass this bargain! 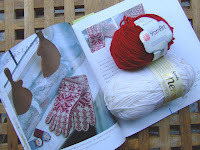 Norwegian gloves (from the Japanese book of knitting) - when we came home last night I couldn't wait and cast on for the first glove, then while watching tv ("Yes, Minister" and "Monarch of the Glen" on BBC Prime) I suddenly finished the cuff! ^^ I love it completely! 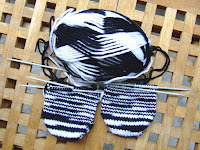 Zebra socks - I've just started a pair of socks from a soft 50/50 wool/acrylic yarn from my stash, because a. I wanted to use up some yarn I have, b. it is always good to have a pair of mindless knitting on the needles. Simple toe-ups (short rows, and it's high time I learned some new technique!). Yes, I remember I promised a FO at the end of the post - and here it is! 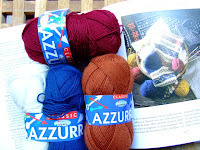 Because of the multitude of shades on the yarn the pattern may not be very visible, but you can see there is something interesting going on on these socks and that's fine for me. 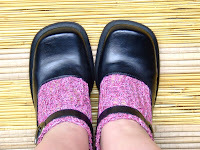 The cotton yarn turned out nice for a pair of anklets but I think I wouldn't use them for the full socks because they would not stay up properly. I changed the pattern a bit because my gauge was a bit bigger than suggested. 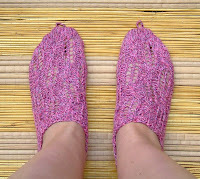 So, I repeated the lace pattern twice (24 rows x 2), and then I finished the toes in plain stockinette, adding a small loop at the very top of each sock - I may use it for hanging them to dry after washing and they look fun! *^v^*.